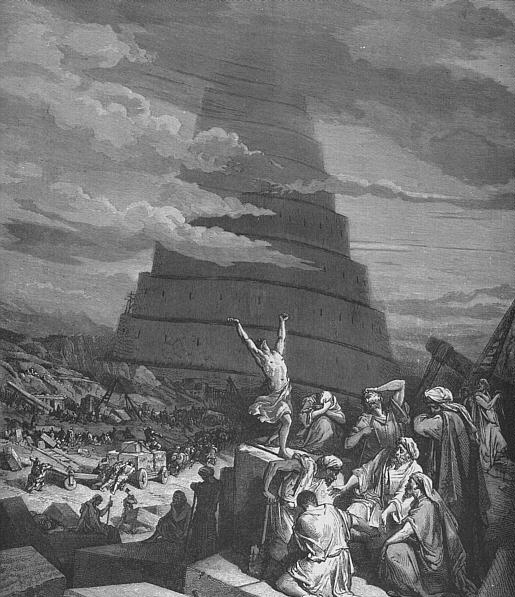 It might seem, in this world of constant misunderstanding, that we might get along better were it not for the Tower of Babel. I mean, we call it a language barrier, right? So why are some people upset about the extinction of languages? Rebecca Morelle writes of how economic success may be behind language extinction in an article on the BBC science and environment page. There are some—many entrepreneurs—who see no cause for mourning. I have to wonder, though. I cut my academic teeth studying dead languages. Koine Greek and “Classical” Hebrew are no longer regularly spoken, and really haven’t been for centuries. Then I moved on to rediscovered languages: Ugaritic, Akkadian, Epigraphic South Arabian, each sounding more exotic than the last. Would world commerce exist if we were all hampered with Sumerian? We got on fine without the wisdom of the past—why should we even care? I see politicians, mostly male, arguing in the “most advanced” government in the world, that women shouldn’t be given the full benefits of health care because they misunderstand the Bible. It is easily done. As I told my many students of biblical Hebrew over the years, language is not just words. Languages are ways of thinking. No translation is truly perfect. If you want to understand the Bible, you must do it on its own terms: learn to conceptualize in Hebrew and Greek, then come back and tell me what you think. It is, however, much easier to let King James do the talking. A man’s man. Just don’t ask what he did after hours, right Robert Carr? Something seems to have gotten lost in translation. Languages are more than just ways of expressing ideas. They are the basis of cultures. When languages die off, cultures soon follow. Do you suppose that everyone on Papua New Guinea goes to work wearing a tie? Just give it some time. We call it progress, and it is inevitable. It has happened even closer to home, for those bound to the States like me. It used to be that academics had a language that didn’t necessarily included economics. The rarified domiciles of words like trenchant and salient and boustrophedon soon became superannuated. What are you trying to sell here? Dictionaries? As business marches unstoppably ahead, consuming all in its path, our lesser languages quietly die. With those languages ideas also pass away. With each demise, the world becomes a poorer place. Maybe it’s time to start building a tower. The Roman Catholic Church has been making headlines again. Yesterday’s newspaper afforded two headlines to the great mother church – or maybe I should say “pleasant parent church.” The first story regards the Pope’s new book, Jesus of Nazareth-Part II, due for release next week. 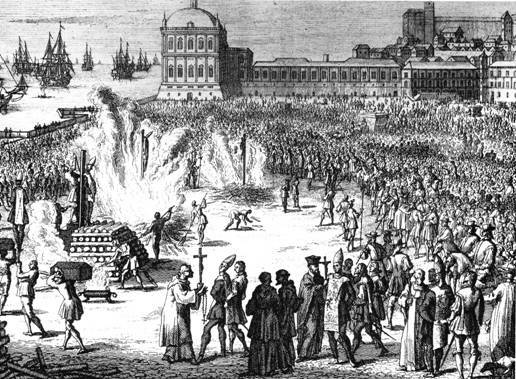 In it the Teutonic Vater exonerates the Jewish people for the death of Jesus. The embarrassing mastodon in the room, however, is why the church ever blamed the Jews in the first place. From the beginning Christian theology declared Jesus’ death part of God’s master plan. It also provided a convenient excuse for centuries of hate crimes that continue to this day. Believers, however, are quick to justify God’s actions, even when the Bible tentatively raises its own objections. In my prophet’s course, many students had trouble accepting the fact that the story of Micaiah ben-Imlah in 1 Kings 22 indicates that God sanctions lies in the mouths of prophets for a larger divine purpose. Perhaps we should also look for Micaiah ben-Imlah-Part I on the bookstore shelves soon. The second article, already making its rounds on the Internet, concerns a new translation of the Bible. Shaking the traditional word “booty” from its vaunted position, the Ash Wednesday Bible calls it “spoils of war.” I was pleased to see my personal friend Bishop Sklba interviewed as part of the release publicity. As he rightly notes, “English is a living language,” to which some have subtly added, “and a dying art.” The article rehearses the sophomoric tittering at funny-sounding verses that has plagued the church ever since the laity have been educated. Gelding the Bible is a small price to pay for sanctity. Regardless of efforts on the part of the religious, the Bible remains an often bawdy text set in the context of a sexist and supersessionist world. It is the world in which the Roman Catholic Church came of age. As we start to see the first, faint blooms of a distant equality beginning to push through a vast leaf-litter of decomposing, brown tradition, the theology and foundational document of the church require some window-dressing. In this world of aggressive, bully governors and oh-so-self-righteous politicians, it is encouraging to see a massive religious organization bashfully blushing and suggesting that shoving others may not be the best method of getting your own way. Could it be that the church still has some valuable lessons to teach the world? Translation. The Bible as we know it would not exist without translation. Ours is a culture of convenience — Americans want divine revelation dished out in easy-to-swallow portions in their own tongue. Going through the rigors of learning new alphabets and grammatical systems, not to mention the eerie specter of textual apparatus, are enough to frighten off all but the most stalwart of truth-seekers. This is a good thing. We would never advance as a culture if we all had to spend our time learning actually to read our religious texts as they were written, only to find out that we have no original texts at all. So we trust our translators. A few weeks back I posted an entry on Andrew Schlafly’s misguided (imho) Conservative Bible, devoid of liberal bias. Since then Stephen Colbert’s interview with Schlafly has been making its rounds on the internet and thousands of people are now aware of the project and its biases. I stand by my original objection that biased translations are unfair representations of the actual ancient texts. But it looks now like I’ll have to be eating crow. A new translation is scheduled to arrive in stores next month, and it looks like it may have a bias. Still, it is a translation that no internet-savvy reader can afford to ignore. Yes, the Lolcat Bible is nearly ready to pounce from the press. 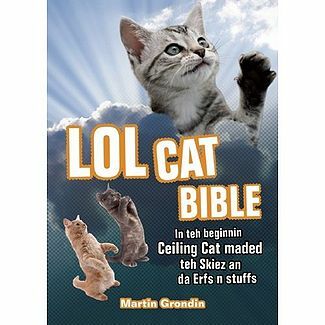 The culmination of the Lolcat Bible Translation Project, over two years in the making, a Bible in Lolspeak will soon be available. Comparing what I’ve seen of the two projects, I think there is more truth in the Lolcat Bible than in the Conservative Bible. I’ve studied more ancient languages than any sane person rightfully should, but I do rely on my able research assistant (aka daughter) to help read Lolspeak. She suggested the title for this post, but the full text reads, “Im in ur blogz, postin mah wurdz of wizdum.” That’s straight from the mouth of Ceiling Cat! This podcast addresses the issue of agenda-driven Bible translation. Although all translators, being human, have agendas, typically they are for the advancement of knowledge. The news about Conservapedia’s Conservative Bible Project suggests that progress should be turned back to the first century and fast-forwarded to the Neo-Con agenda. The trend is disturbing because not many Americans have the essential background to assess critically whether Bibles are translated with serious scholarly intent or not. The ten principles of conservative Bible translation from Andrew Schlafly’s Conservapedia are examined.